Bogmalo Beach is another hidden away and relatively small beach in South Goa, with a few shacks open during the season. But one of the best ones on that stretch has to be the Joets shack, and it also happens to stay open throughout the year. Though the locals still call it a shack, Joets has now grown in to a fairly large space. 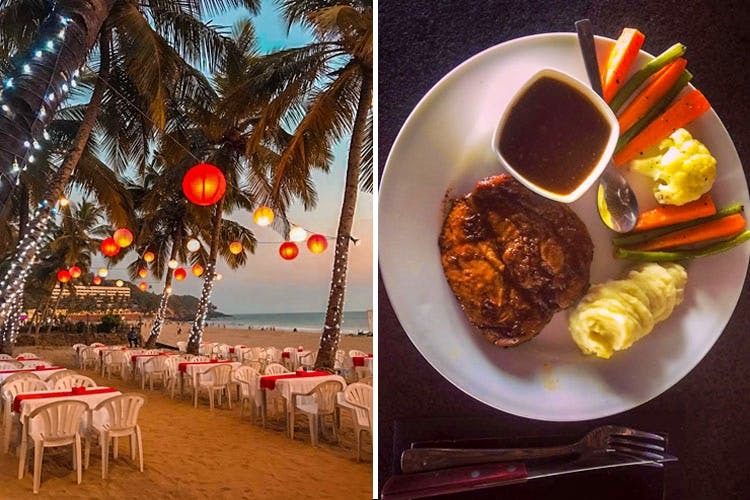 With Bogmalo beach being pretty close to the airport, this makes it a good place to visit for a meal before your flight out. And the beach is again beautiful, not very crowded, and so ideal for even spending a day there. The beautiful creek just around the corner is also why I love spending a day here, as you can just take your drink and go for a walk and sit there. I would definitely recommend this place for their fresh seafood. Their Rawa Masala Pomfret Fry or Seafood in the local Recheado Masala or the traditional Goan Curry and rice are must try items. Or if in the mood for some pork, then I would recommend their Pork Chops with a chilled local Susegado (on tap) or King’s Beer. They also have a pretty good selection of Chinese, Indian & continental fare, but the Goan food is where they excel. With imported beers like Edelweiss & Heineken on tap that go really well with their Fish & Chips, as well as live music most weekends, it definitely adds to the overall fun factor here. Sitting pretty right on the beach, in the evenings they will even put on tables outside the main restaurant area, so we just love the feeling of squishing sand under our bare feet. Again food is always freshly made so don’t expect quick service, and just sit back and enjoy the view whilst you wait for it. Joets even has a small guesthouse attached to the restaurant, if you are looking to stay there. If you are a guest of the nearby Coconut Creek Resort, then you can add your bills here to the resort tab. That means no need to carry your wallet to the beach and worry about it whilst you are in the water.